I wrote in a previous post that abortion is essentially the same as pagan child sacrifice in that it involves the killing of babies in an effort to attain physical pleasure and material wealth. 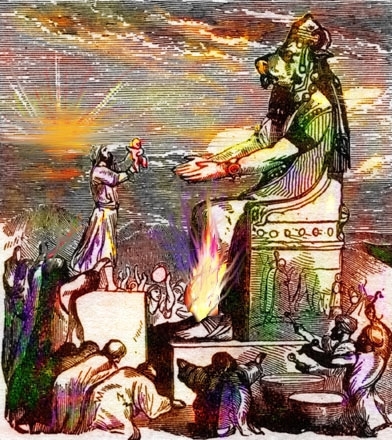 Abortion and child sacrifice to idols are similar in that the motivation of the parents is the same, the result for the child is the same, and the evil spirit behind it is the same. Today brings two fresh examples of this truth. It may or may not be our final hour, but this certainly marks a new level in our descent into paganism and the celebration of evil. We must fight harder to end the sacrifices.